The Republicans had one primary freaking objective and they couldn’t even get that right. Earlier this week, seven Republicans betrayed all of us and refused to vote for a straight repeal of Obamacare. I’m ashamed to say one of those is Dean Heller from my state of Nevada. Shame on him. If the Republicans had listened to Ted Cruz, Mike Lee and Rand Paul and had done a straight repeal, they would have had two years to straighten things out and let the free market do its thing. But no… these people wanted their pork and their kickbacks from the insurance industry. They all need to go. Seven Senate Republicans broke with leadership Wednesday to vote against a so-called “straight repeal” of ObamaCare. Sens. Lamar Alexander, R-Tenn.; Shelley Moore Capito, R-W.Va.; Susan Collins, R-Maine; Dean Heller, R-Nev.; John McCain, R-Ariz.; Lisa Murkowski, R-Alaska; and Rob Portman, R-Ohio, joined all Democrats to defeat the amendment, which would have given Congress two years to devise a replacement to the 2010 Affordable Care Act. Murkowski attracted Trump’s ire earlier Wednesday when she and Collins voted against even allowing debate on GOP legislation to repeal much of the Affordable Care Act. The final tally was 51-50, with Vice President Pence breaking the tie. Early Wednesday, Trump tweeted that Murkowski had “really let the Republicans, and our country, down.” Murkowski responded that she was “comfortable” with her vote. Heller, who is up for re-election next year, was the focus of Trump’s attention during a meeting with GOP senators to discuss health care at the White House last week. “Look, he wants to remain a senator, doesn’t he?” said Trump, who added that the people of Nevada would “appreciate” if Heller supported repeal legislation. The so-called ‘Skinny Repeal’ failed this morning thanks to John McCain, Lisa Murkowski and Susan Collins. They voted against it because there wasn’t enough pork, etc. McCain wanted more Medicaid for Arizona. Having said that, the bill should have failed. If it had gone through, nothing would have changed and premiums would still have gone up 20 percent. Trump wanted the straight repeal and these asshats just wouldn’t do what the voters who elected them wanted them to do. Every one of them should voted out. I had some sympathy for McCain, but no more. 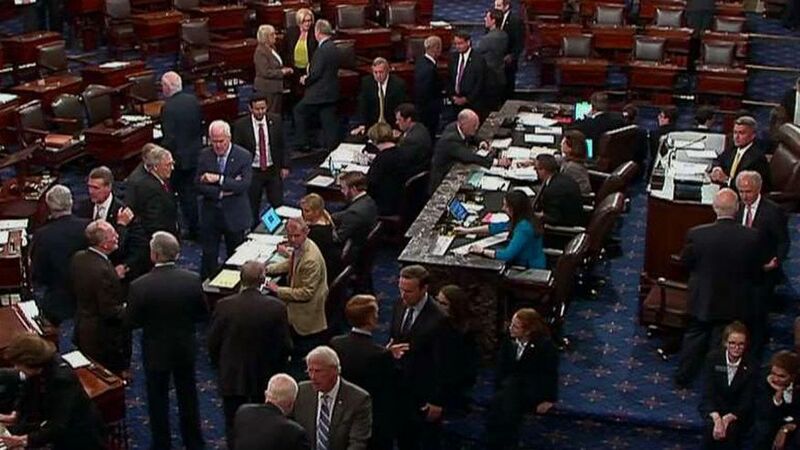 When the repeal effort died for the last time this morning, there were gasps on the floor of the Senate. At least some of these people know that their careers just ended. The RINOs that did this let the entire country down. Schumer and Warren were all smiles and I’ll bet Obama was as well. Now, Trump will let this implode as premiums sky rocket and Americans are devastated. When that is done, there will be only two choices as Trump suspends the mandate for paying for healthcare. Go back to the free market and face a fight in the Supreme Court that may or may not be won, or go to single payer. It does not look good at this point. Shame on John McCain and the others.